You’ll have to excuse me. 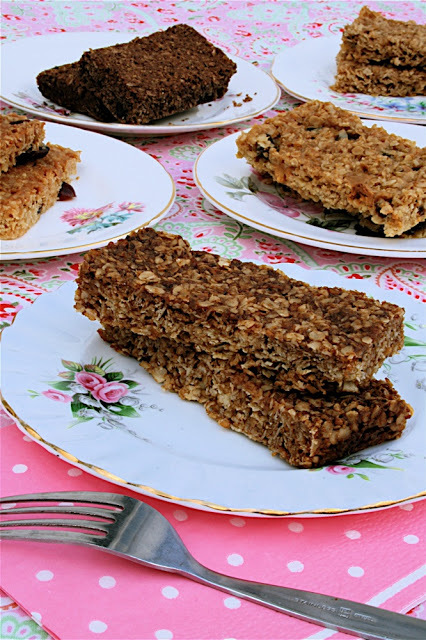 The past few weeks have been rather frenetic due to this and this and it has taken me longer than promised to share this Cybermummy flapjack recipe in FIVE flavours and host a giveaway for my Cybermummy sponsor, Flahavan’s. I’ve also been doing my first ever edited movie, a 3 minute film in which I mostly sound like Joyce Grenfell whilst Ted helps make flapjacks. This video is being submitted to Cafe Bebe‘s Just Vlog It event, which this month is on the theme of blogging or summer. Not sure this is what was expected but for a food blogger this is just part of what goes on behind the scenes. Maybe my next video can be about food styling and photography?! For several days after, whenever I asked Ted what he wanted for dinner, the answer was “flapjack”. So why all this flapjack fixation? I decided I would like to attend Cybermummy, only since I’d just been on a food blogging conference I was unsure how my husband would respond to me disappearing for another weekend, especially forking out for a ticket. After some conferring with Alison at Deer Baby I sought a sponsor and happily, Flahavans were delighted to help. If you’re not familiar with them, Flahavans are Ireland’s leading oats producer and are now available in the UK. As well as bags of oats they also do timesaving microwave porridge sachets and pots. Now that I’ve mastered flapjacks I intend to try out my own oat cakes and using them in crumble or muffin toppings. My husband helped cut my cards up and wrap… under protest. As well has handing out sachets of Flahavan’s 3 minute microwave porridge oats to fellow Cybermummy delegates I also wanted to give people something of my own. 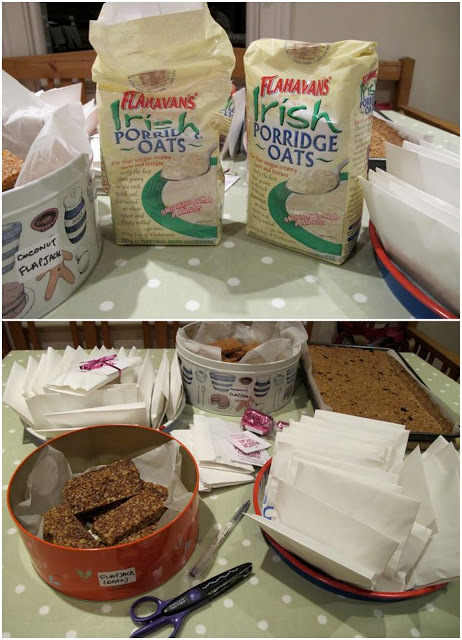 Initially I’d toyed with macarons or mini cupcakes but as soon as Flahavans were mentioned, I said FLAPJACKS! I have TEN goodie boxes of Flahavan’s products for readers in the UK to enjoy. To enter, please leave a comment below this post no later than midnight BST Sunday 18th July 2010. The winner will be chosen by random.org on Monday 19th July and the winners’ names listed on this blog in the first post after all ten have responded. Anyone who doesn’t respond by midnight BST Wednesday 21st July will forfeit their goodie box and a new name will be chosen. The method is the same for all five flavours so I am showing the ingredients per flavour under their respective photos and then you can follow the instructions below. Recipes were adapted from several sources; Mary Berry’s Baking Bible, The Sainsbury Book of Teatime Favourites by Brian Binns and Green and Black’s Chocolate Recipes by Caroline Jeremy. 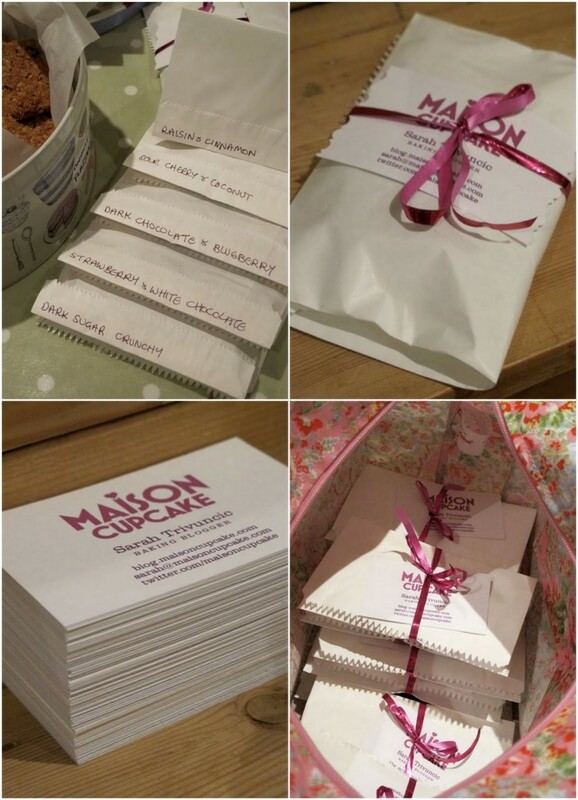 Each recipe makes 20-24 bars if you use a 30x23cm (12×9 inch) tray bake or roasting tin. 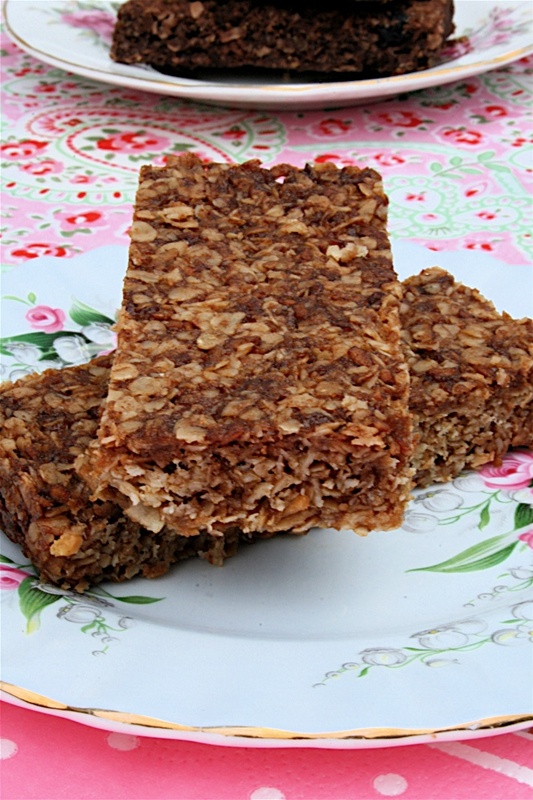 The plain flapjack recipe uses fewer oats but strangely seemed to produce the same quantity of bars. 1. Preheat the oven to 160c/Gas Mark 3. 2. Melt the butter, sugar(s) and golden syrup in a small saucepan on a low to medium heat. 3. Mix the dry ingredients in a large mixing bowl. If you are using chocolate chips you can save these to press into the surface of the bars before they go in the oven but it’s up to you. 4. Grease and line a 30 x 23cm or 12 x 9 tray bake or roasting tin with baking parchment paper. 5. Pour the melted butter/sugar/syrup on the dry ingredients and stir until well incorporated. 6. Pour the mixture into your tin. Spread to the edges and pack the mix flat with clean fingers to compress it a little. This prevents crumbling. 7. Bake for 20-30 minutes in the middle of the oven. Ovens vary a lot so I’d check your flapjacks every five minutes after 20 minutes until you are happy with the colour. 8. Allow to cool in the tin before cutting into fingers. Keeps for one week in an airtight tin. Many thanks to Flahavans for making it possible for me to attend Cybermummy. Wow, that looks like a lot of hard work, but all those flapjacks look amazing. I really like the look of the cinnamon raisin flapjacks. I may try that one. You're a natural on camera – as is Ted. That's some clever editing – using dissolves and everything. I can vouch for the yumminess of the strawberry and white chocolate ones. After being so busy chatting at lunch to eat much, and starving on the way home, I rifled in my bag to find a much welcome treat. Lovely flapjacks. I must find "my" recipe for some of my charity baking. I also suspect Ed may like some to take sailing. These look really good! Which is your personal favourite? Will defo be filing that little gem of a recipe. Love your video with the gorgeous Ted – cooking with kids is hilarious. Your flapjack was my tea on Sat evening when I ended up stranded by sleeping baby. It was fabulous. Love the look of the Sour Cherry and Coconut flapjacks, you have inspired me to get baking on this wet Wednesday. Thank you! What a great assistant Ted is! Excellent Vlog. I see a tv show in your future, "cooking with Sarah & Ted". I loved the flapjack too. And have used up all the microwaved porridge you gave me so thanks. They look excellent..im finding it difficult to decide which ones the best! Flapjacks? Wow, who would have known that is what you call them. They look excellent! I would love to try the sour cherry and coconut and of course the rest of them later . . . Thank you for the recipes, I had the Sour Cherry and Coconut at CyberMummy from you and kept thinking I should contact you to get the recipe! I shall be making them this weekend! Interested by the 1st comment, I wonder what flapjacks are called in the US then! I love a flapjack, not made any in ages. I think I would like the plain one best, I see flapjacks as a good filler rather than a fancy flavour. I may recycle some granola into some. I love your little packages and labels. I think Blueberry and Chocolate sounds like a really interesting flavour. I don't actually think I've ever tried blueberries with chocolate. This is definitely my project for this weekend! 5 flavors?? WOW!! you rock! And yes, please consider me for the giveaway. I would love win it and perhaps try a few of your great flavors! I was surprised to learn that flapjacks in the US were known as pancakes. Anyway, liking these flavours esp. the strawberry. And Thank you Sarah for your generousity in giving one of us an opportunity to win this give away. I really didn't know that flapjacks are called pancakes in the US! The strawberry and white chocolate ones sound great but I think my husband would prefer the sour cherry and coconut. 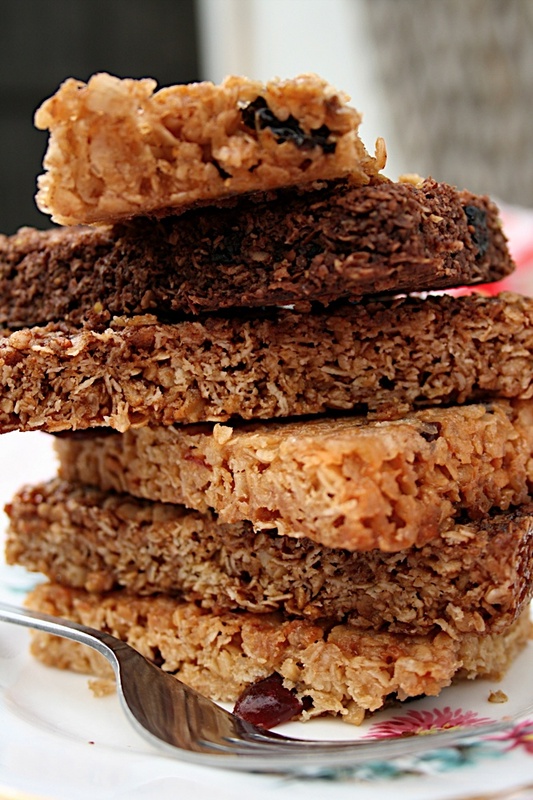 Judging from the tweets, your flapjacks were a major success at Cybermummy! I have never seen soooo much flapjack goodness in one place! Impressed! I love Flahavans! They are the choiciest oats you know. I love the video too by the way – well done. I would never dare video myself for a blog. Unless I had a cute son or daughter to hide behind. Maybe I should borrow my niece! Ted for Prime Minister! Super cute. The flapjacks are delicious-looking too. Loving the Flapjacks one of my favourite snacks used one for the base of a cheesecake once didn't really work yo need the crunch. Oh my goodness. I have put 2lbs on just devouring this page! Oh crumbs, it only seems like hours since I posted this and I've already got 30 comments! Thank you everyone for your compliments about the vid, I hope I have it in me to manage another one! Very interested to find out that flapjacks are pancakes in the US. 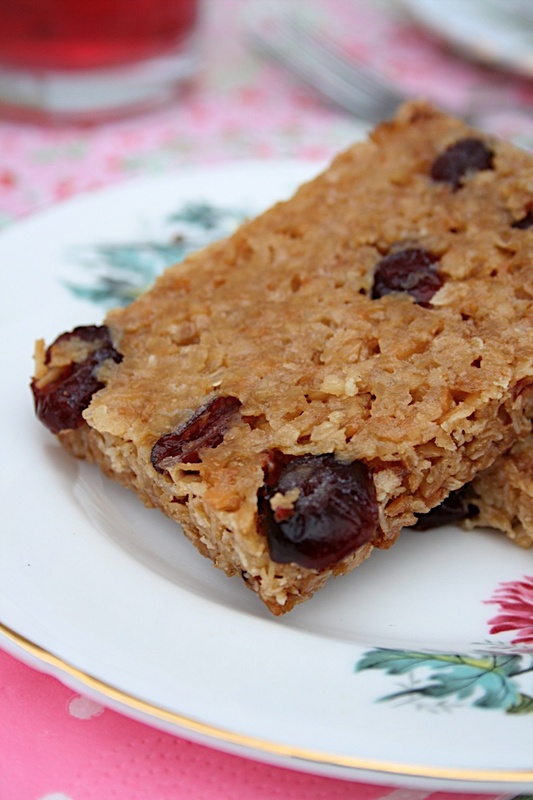 OMG, those sour cherry flapjacks look absolutely awesome! I can see myself having a go at those this weekend! Wow these all look amazing!!! I love these flapjacks, but haven't bought them for quite a while. I'll have to get ordering! Yummy. Yes please. Would love to win. 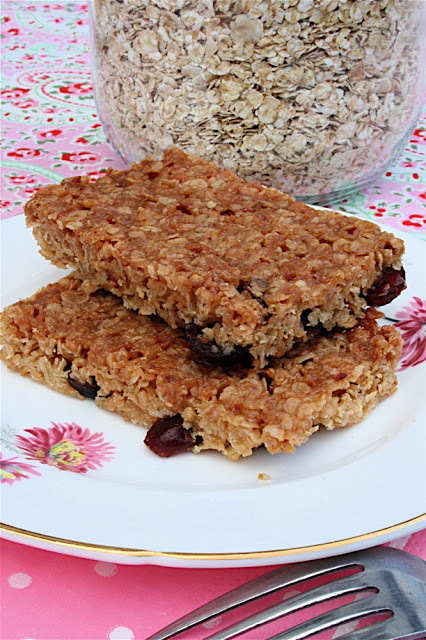 Blueberries are one of the superfoods, and Oats are great for my cholestral, what great flapjack ideas. 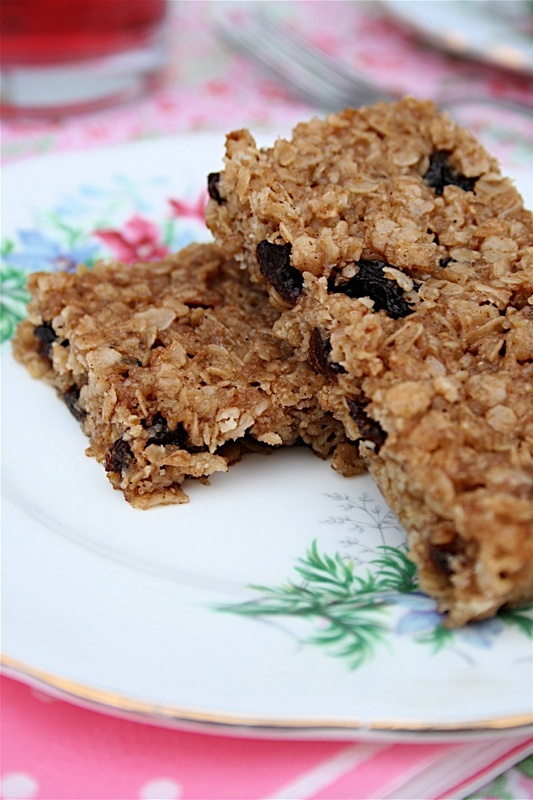 I'm going through a baking phase but have never tried flapjacks – will definitely give them a whirl. 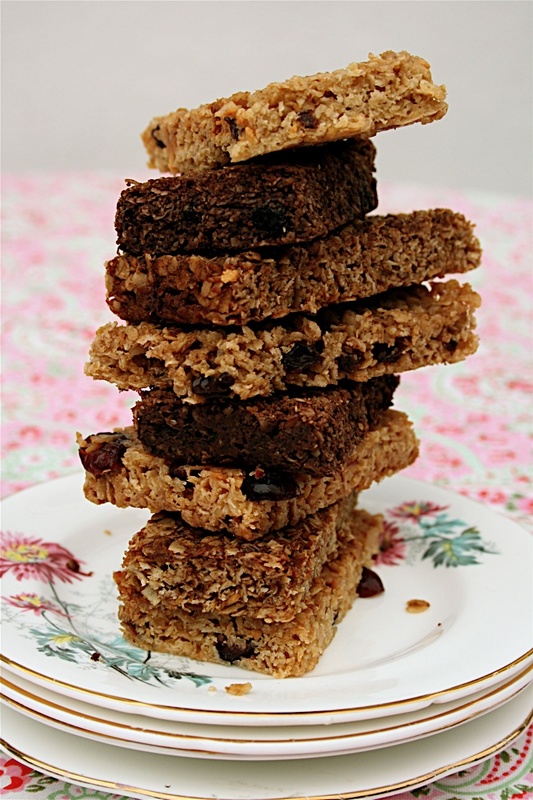 This has definitely inspired me to make some different flavours of flapjacks! Wow – these look great! I love flapjack! these look totally delicious. When I try & make flapjacks they end up crunchy. These look as moist as can be. These look great with an easy recipe to follow. I'll have to give it at try. I make Flapjacks too, Banana and Raisin go down the best. The strawberry and white chocolate ones sound devine! These sound so simple to make – why don't I try it myself I wonder? Maybe motivated now! They all sound really delicious – especially Strawberry and White chocolate. Dark chocolate and blueberry sounds like heaven! Oh my oh my these look so delicious, my work colleague always brings me a treat on saturdays, i would love to return the favour and bring her some homemade flapjacks ,but which one would i choose. My mouth is watering. They look and sound divine. I never knew you could make flapjacks in so many different flavours, will definitely be attempting to make some of these although i'm not the best baker in the world. Flapjacks were one of the first things i made in cookery class at school way back in the dark ages! I have had a love affair with them ever since. My daughter now loves to make them, and, unfortunately for my waistline i still like to eat them! Just found the blog – Wonderful. No time to write much as I'm off to the kitchen to start making Flapjacks. 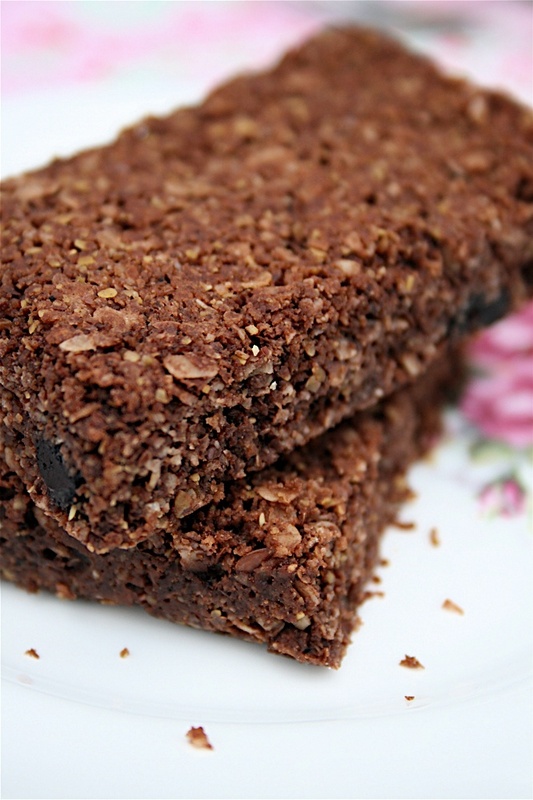 They all seem gorgeous, don't know where to start …………..
lots better than the oldschool cornflake flapjacks with custard! My Mother used to make flap jacks for my children, now they want to make some for their children. Unfortunatly, Mother can't find or remember the recipe she used. We have all attempted to recap those wonderful flap jack memories but without success. UNTIL NOW !! maybe this is the way forward….I do hope so, but the trouble is….which one first ? They all look and sound truly delicious. Well done Sarah and good luck. 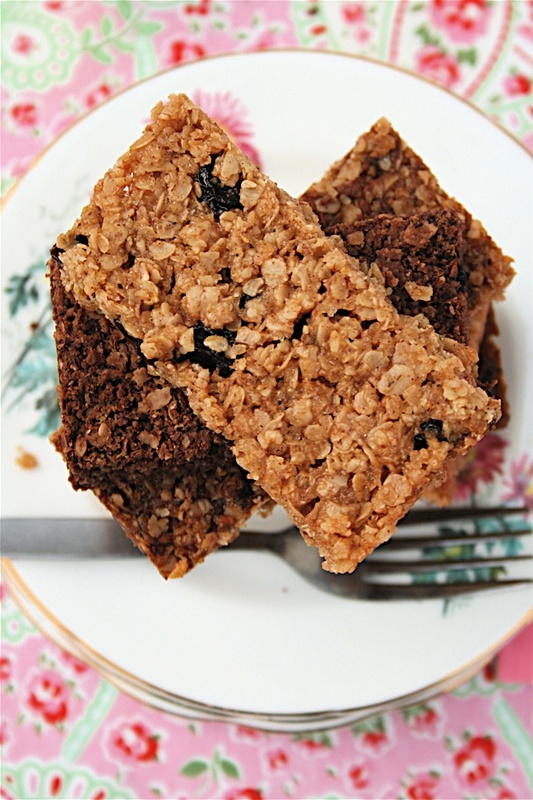 I started craving flapjacks when I was pregnant and my mouth is watering reading all the different recipes! Not only delicious but good for you as well ! The best of both worlds ! I will enjoy making these for my four grandchildren, plus my hubby! !